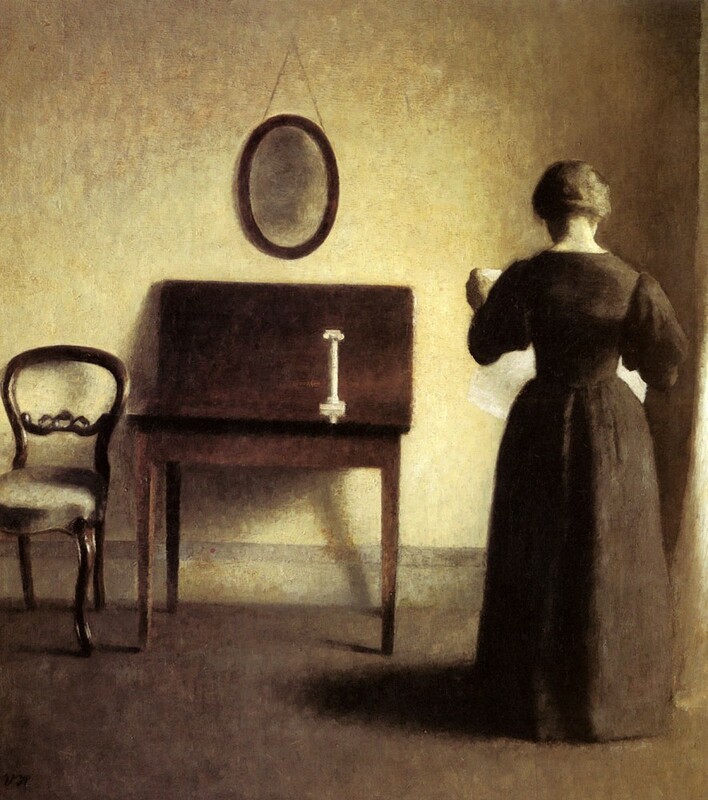 Vilhelm Hammershøi (15 May 1864 - 13 February 1916) was a Danish painter. 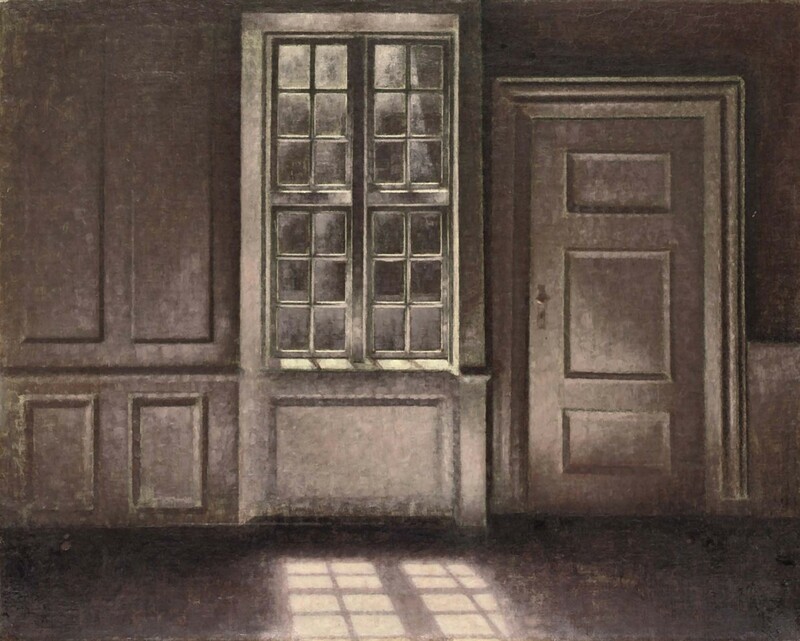 He is known for his poetic, subdued portraits and interiors. 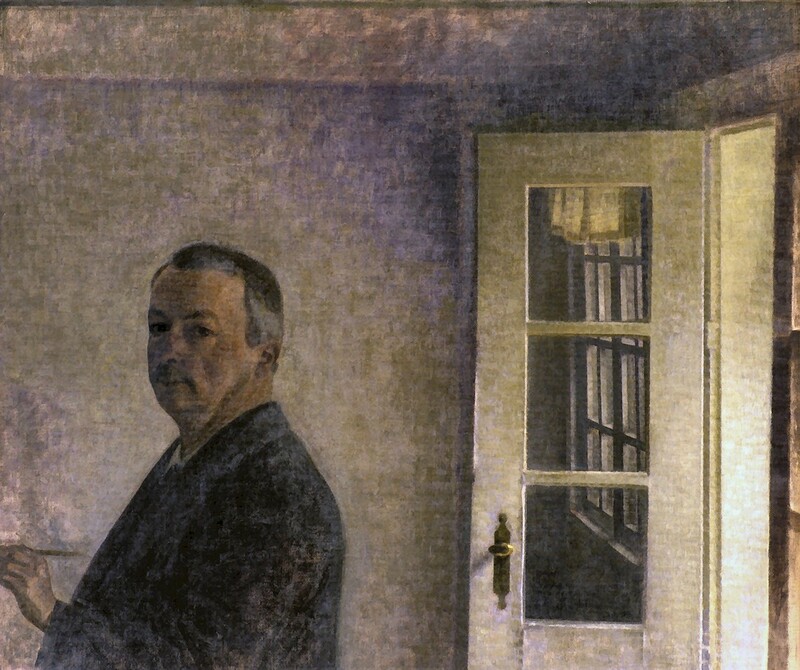 In 1997, Denmark issued a postage stamp in his honour. 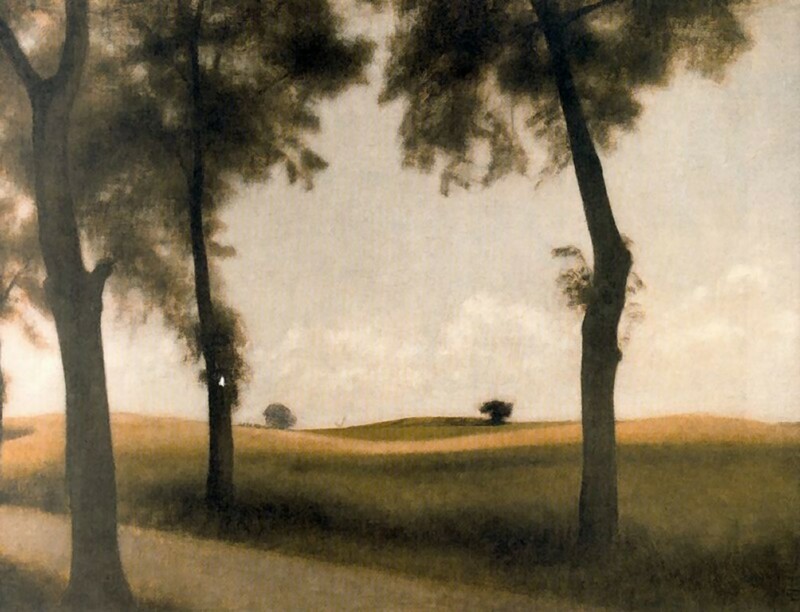 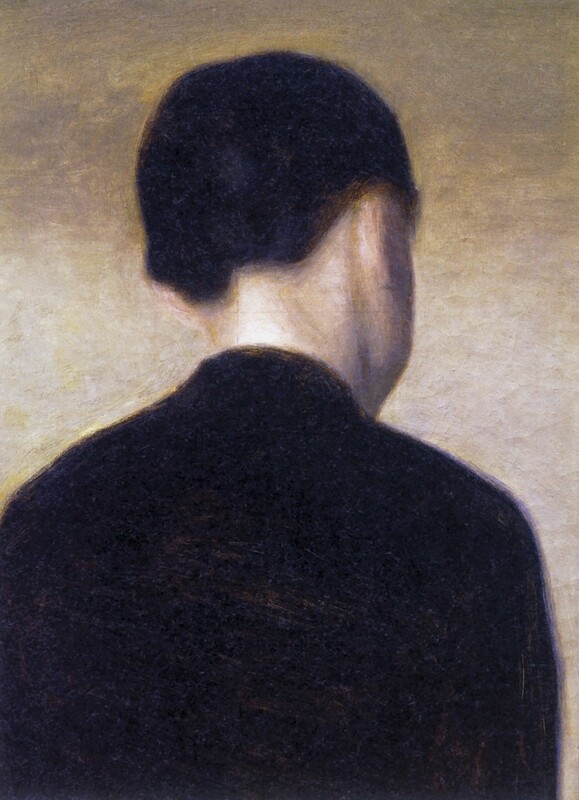 Vilhelm Hammershøi** was born in 1864 in Copenhagen, Denmark. 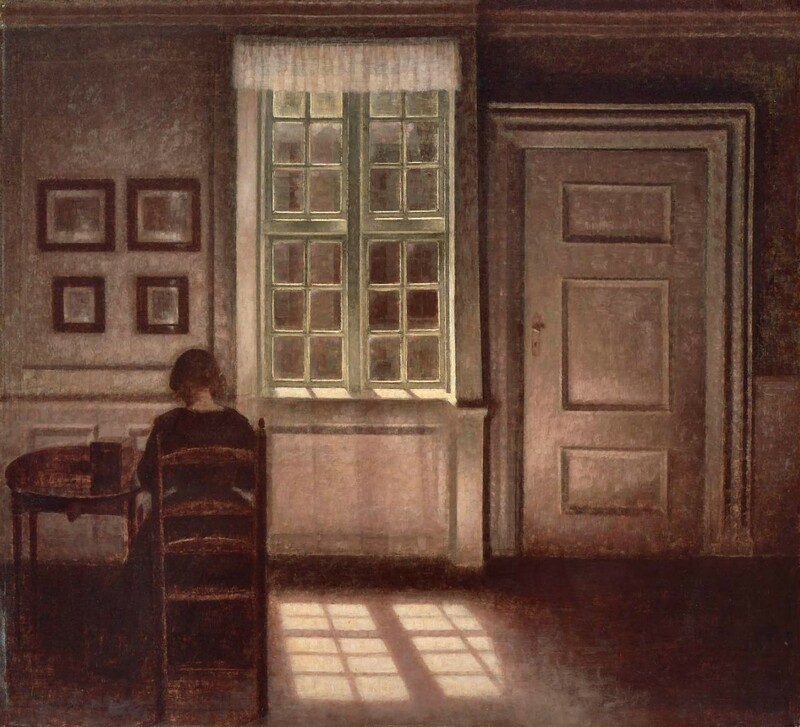 The son of a well-to-do merchant, Christian Hammershøi, and his wife, Frederikke (née Rentzmann), Hammershøi studied drawing from the age of eight with Niels Christian Kierkegaard and Holger Grønvold, as well as painting with Vilhelm Kyhn, before embarking on studies with Frederik Vermehren and others at the Royal Danish Academy of Fine Arts. 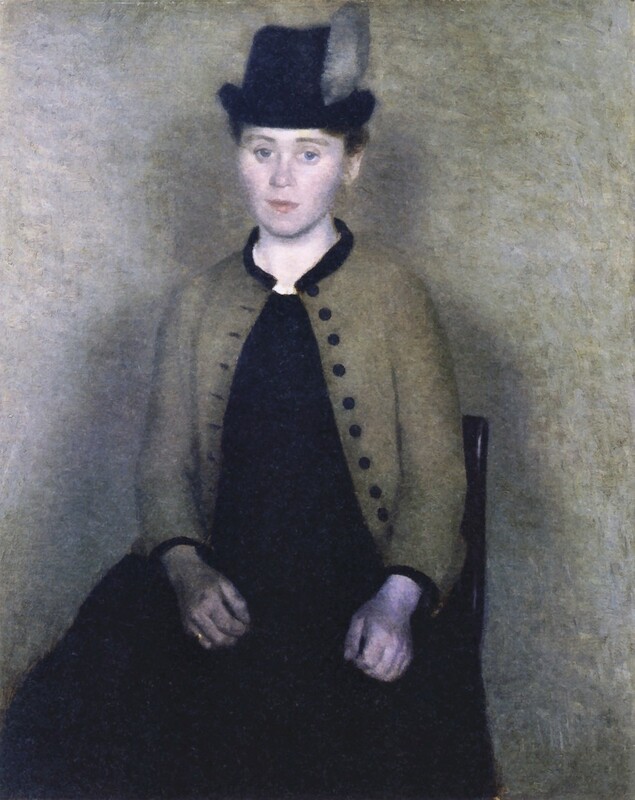 From 1883-1885, he studied with Peder Severin Krøyer** at the Independent Study Schools, then debuted in the Charlottenborg Spring Exhibition in 1885 with Portrait of a Young Girl (his sister, Anna; Pierre-Auguste Renoir** is reported to have admired this painting). 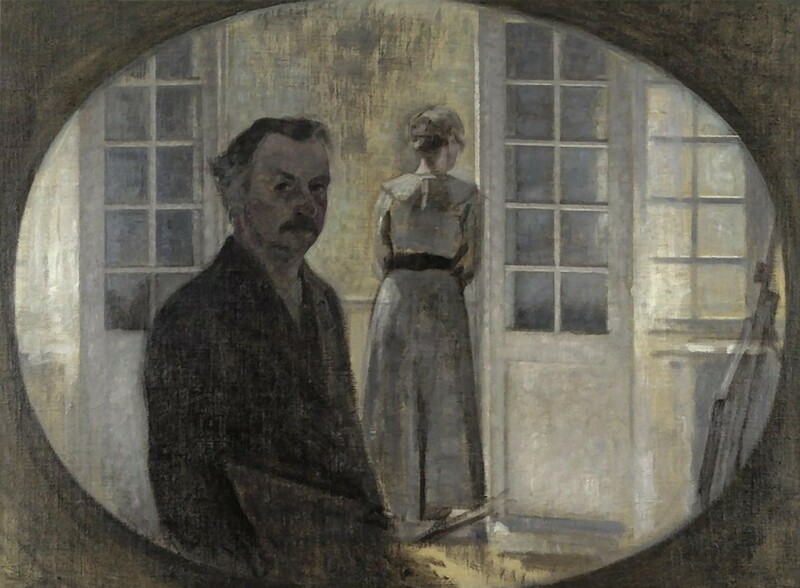 Hammershøi married Ida Ilsted in 1891. 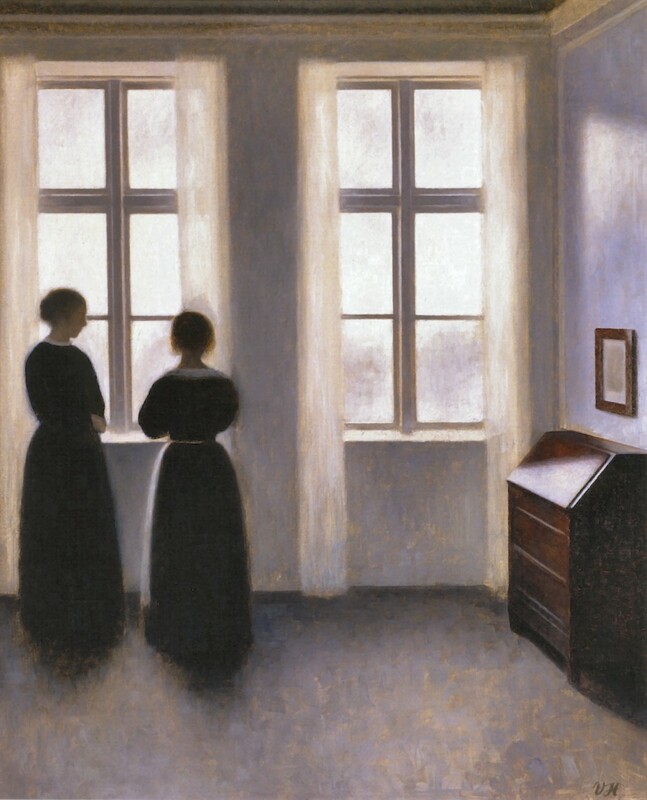 Hammershøi worked mainly in his native city, painting portraits, architecture, and interiors. 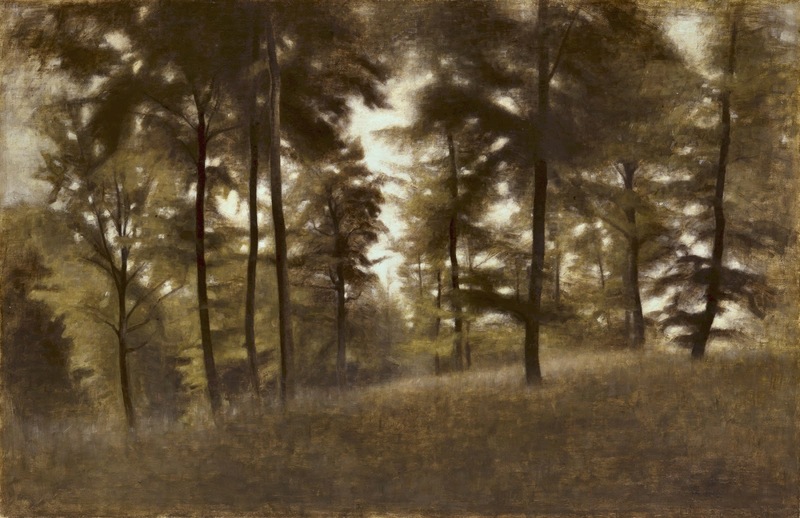 He also journeyed to the surrounding countryside and locations beyond, where he painted rolling hills, stands of trees, farm houses, and other landscapes. 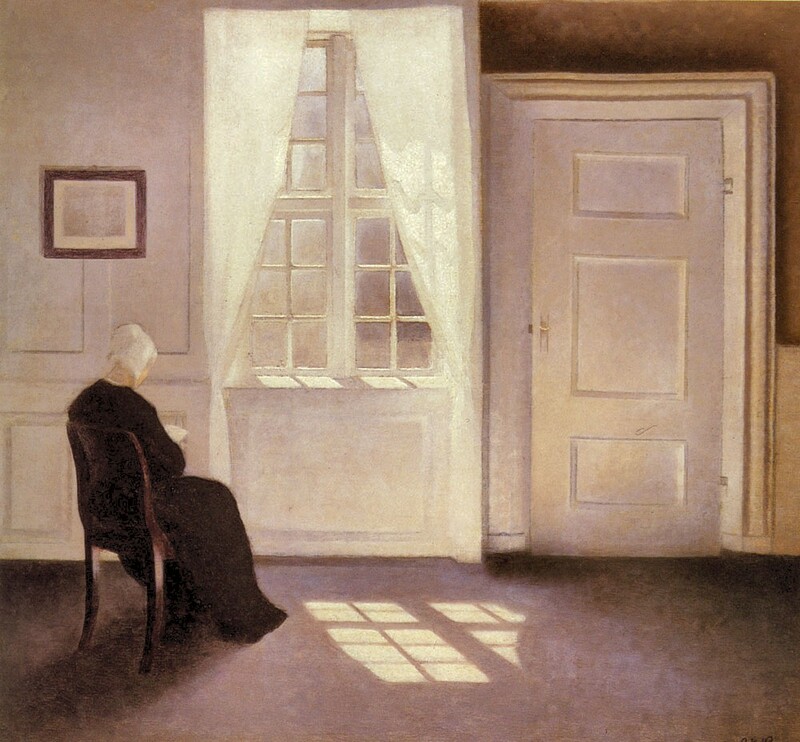 He is most celebrated for his interiors, many of which he painted in Copenhagen at Strandgade 30 (where he lived with his wife from 1898-1909, and Strandgade 25 (where they lived from 1913-1916). 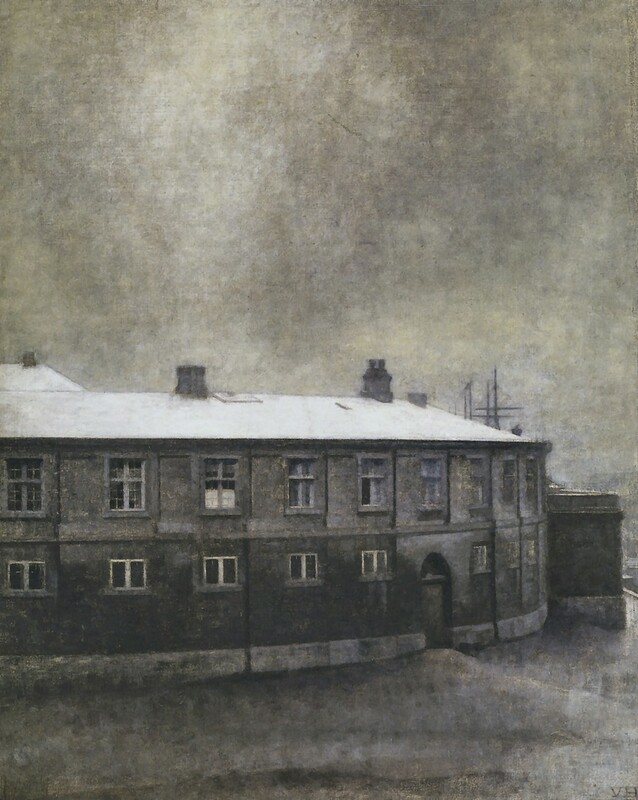 He travelled widely in Europe, finding London especially atmospheric in providing locations for his highly understated work, suffused as it was at the time with a foggy, coal smoke polluted atmosphere. 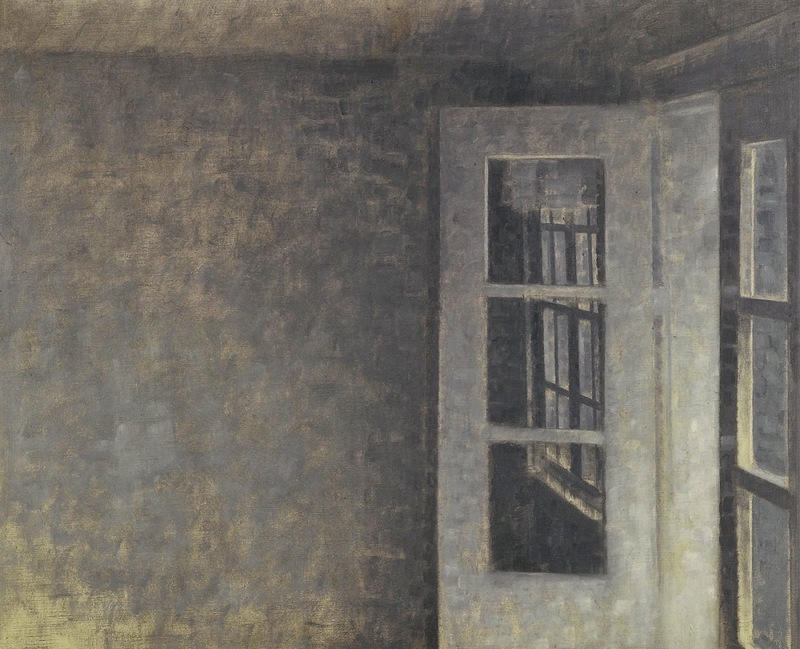 His work in consequence has been described as "Monet** meets the Camden School". 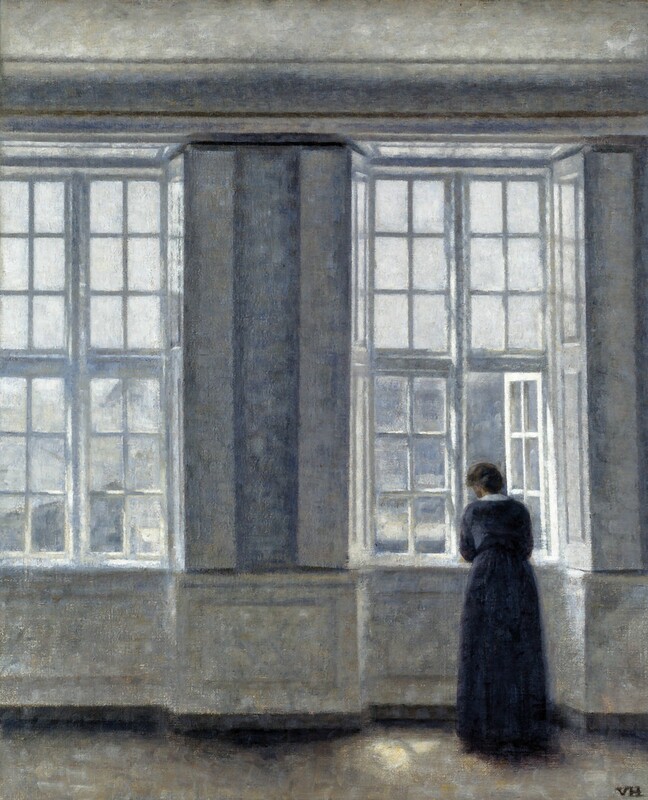 Hammershøi's wife figures in many of his interiors, often depicted from behind. 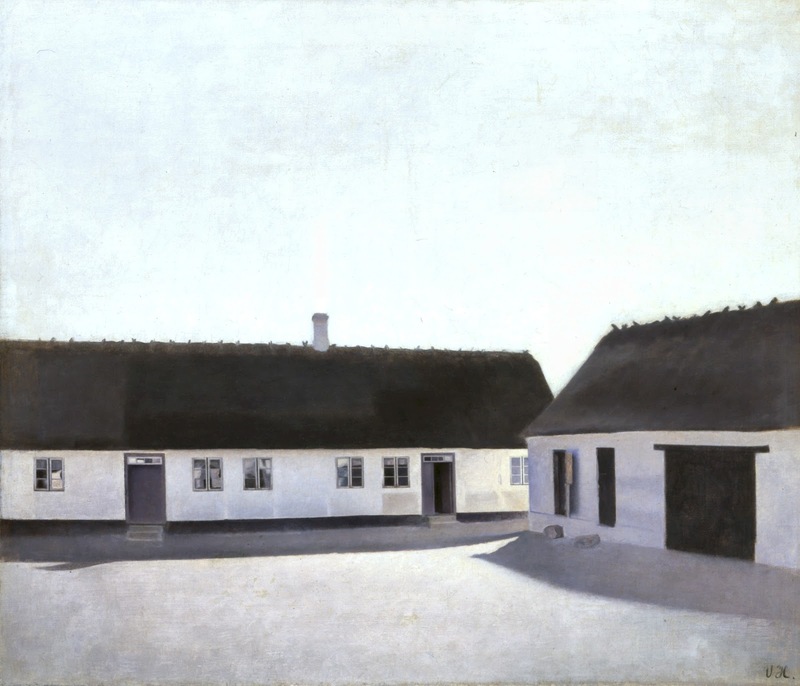 Ida is also the model in many similar works by her brother, Peter Ilsted. 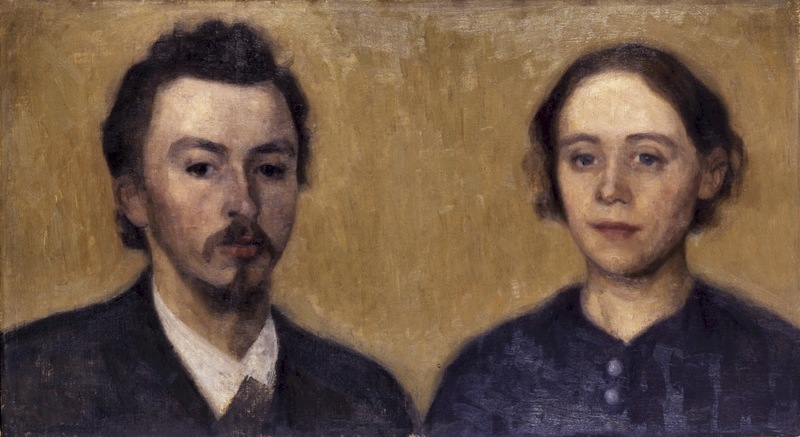 Peter and Vilhelm were lifelong friends, business partners, and colleagues. 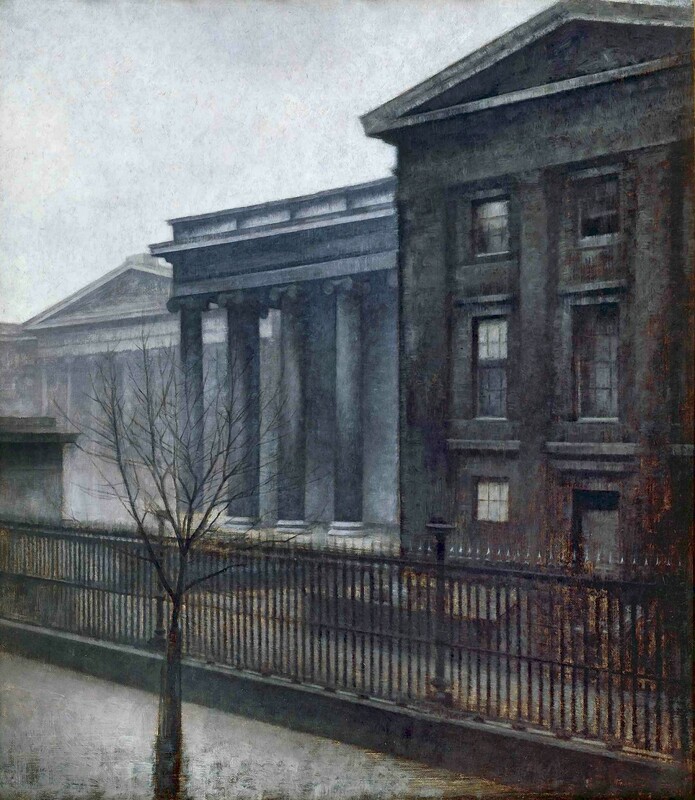 The Metropolitan Museum of Art held an exhibition of their collective works in 2001, and there was an exhibition of his works in 2008 at the Royal Academy of London. 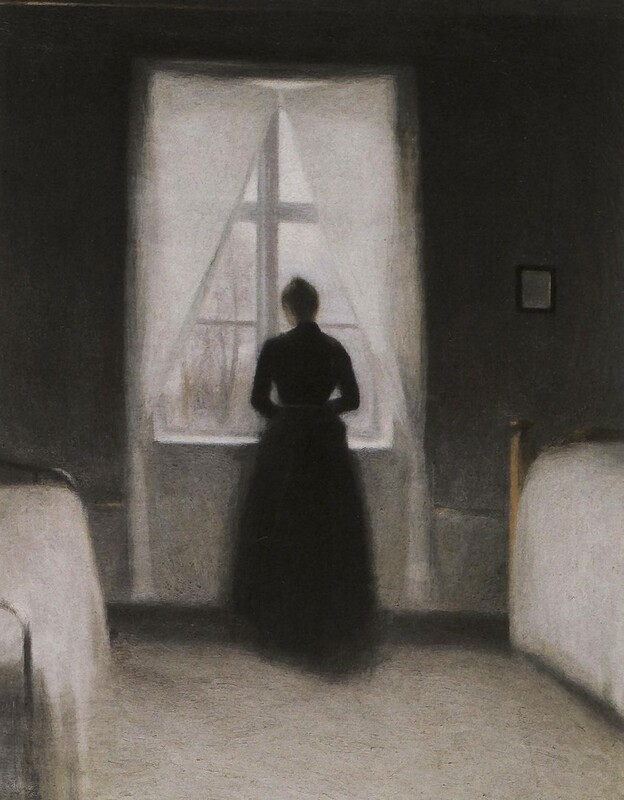 Hammershøi's paintings are best described as muted in tone. 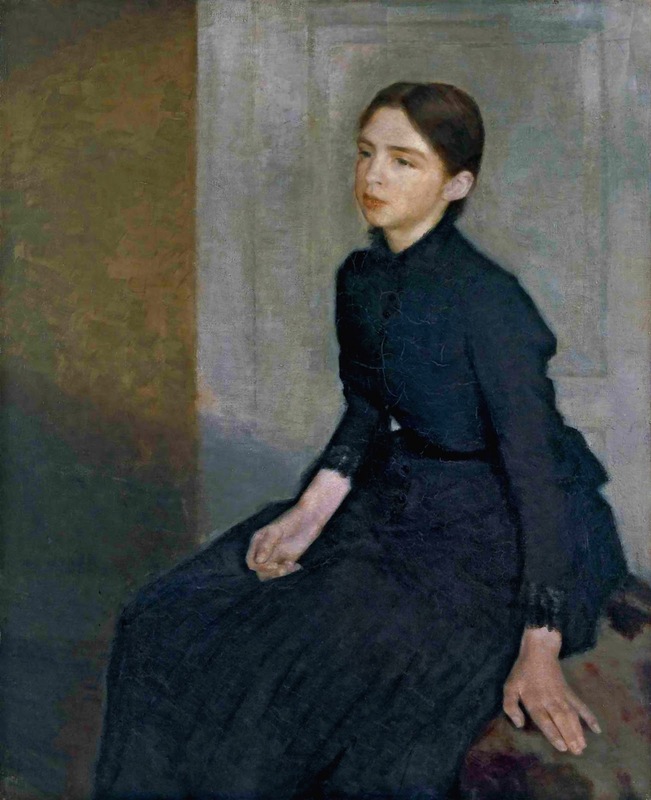 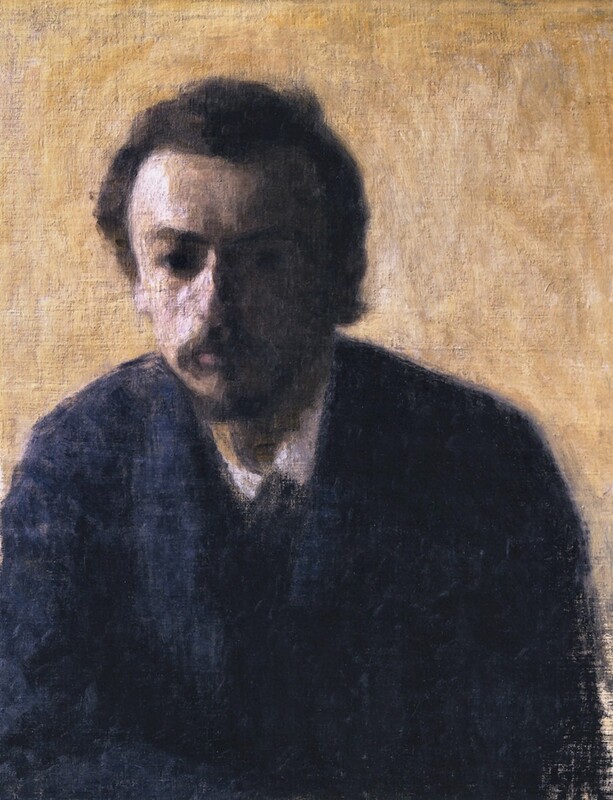 He refrained from employing bright colours (except in his very early academic works), opting always for a limited palette consisting of greys, as well as desaturated yellows, greens, and other dark hues. 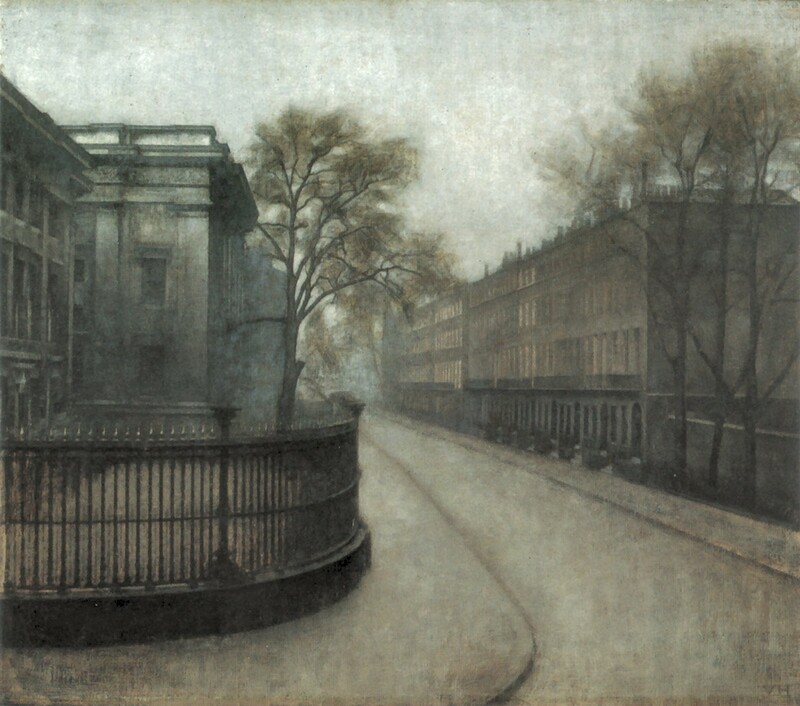 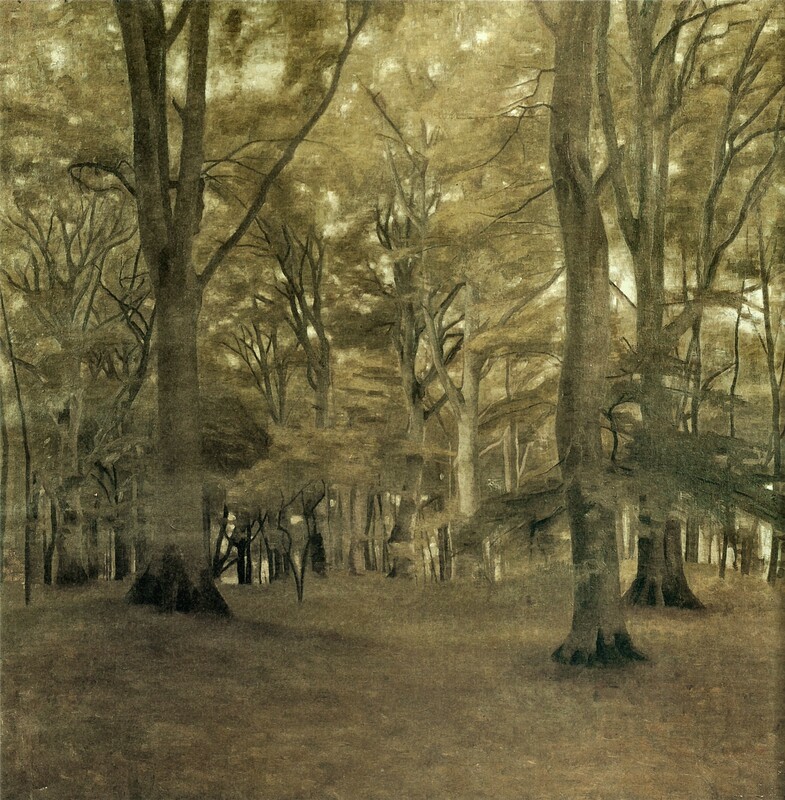 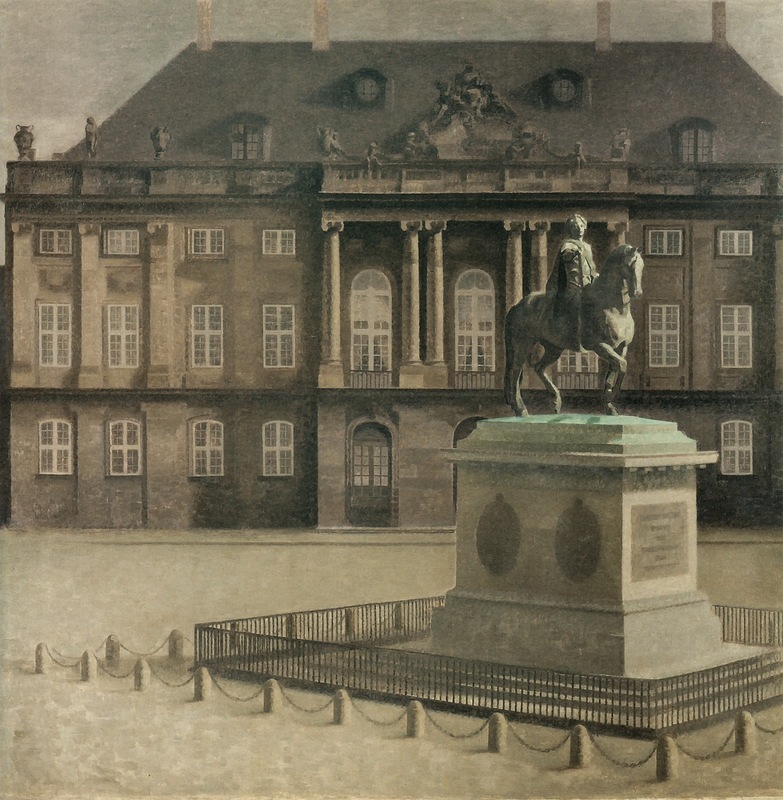 His tableaux of figures turned away from the viewer project an air of slight tension and mystery, while his exteriors of grand buildings in Copenhagen and in London (he painted two exteriors of the British Museum between 1905-1906) are devoid of people, a quality they share with his landscapes. 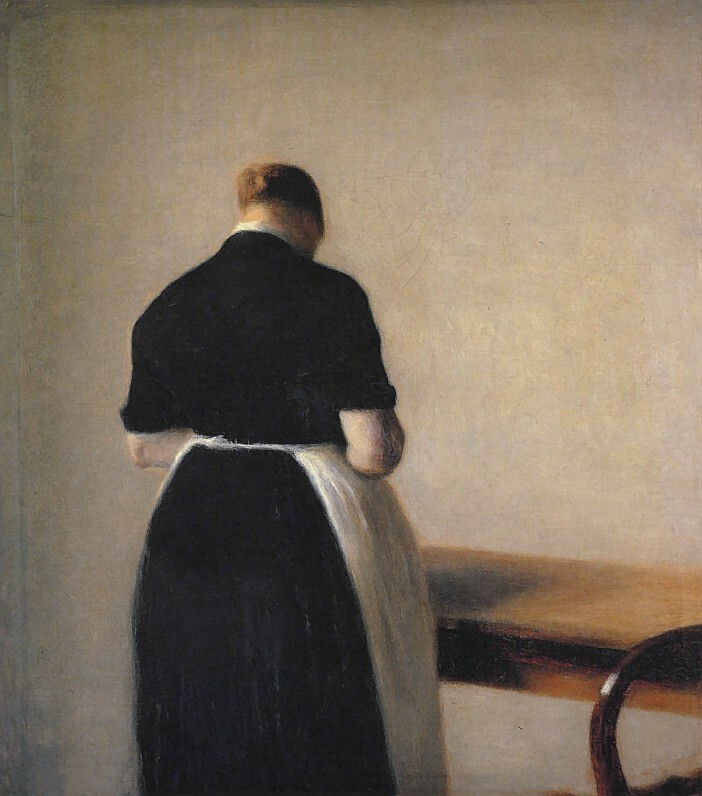 Hammershøi's early works, with their simplicity and recording of the "banality of everyday life", enjoyed critical acclaim. 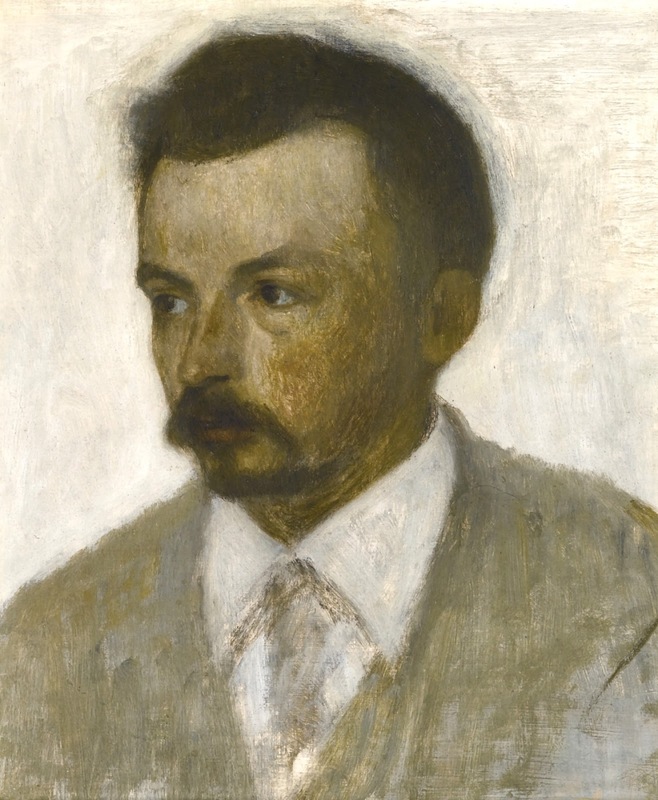 He was sought out by artists and literary figures of the time, among them Emil Nolde** and Rainer Maria Rilke**, who both remarked on his retiring manner and reluctance to talk. 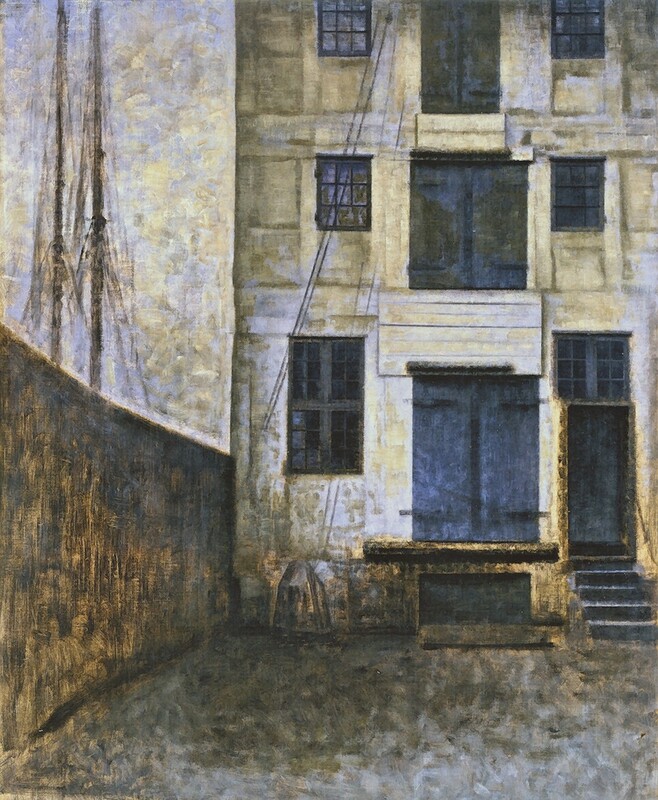 After a trip to Paris, his work became overly detailed. 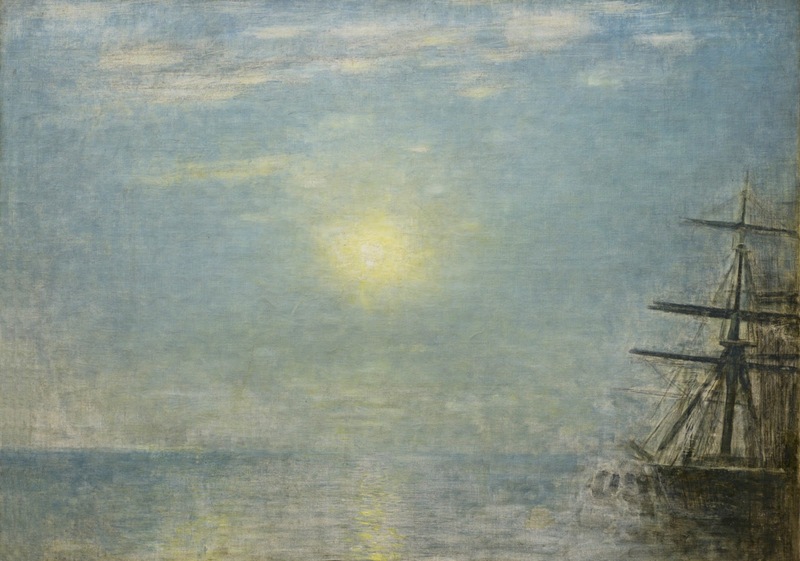 According to art critic Souren Melikian, his "painterly skill remained but the magic was lost". 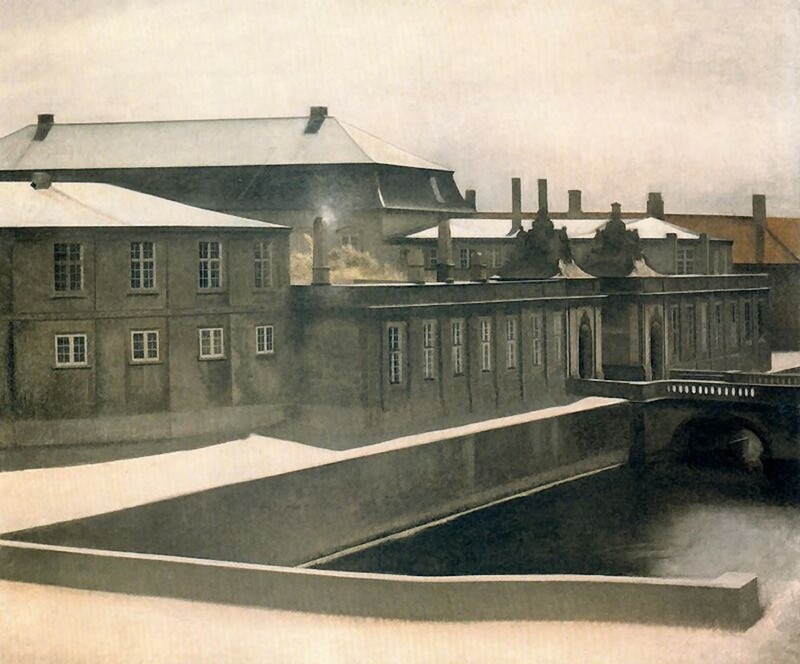 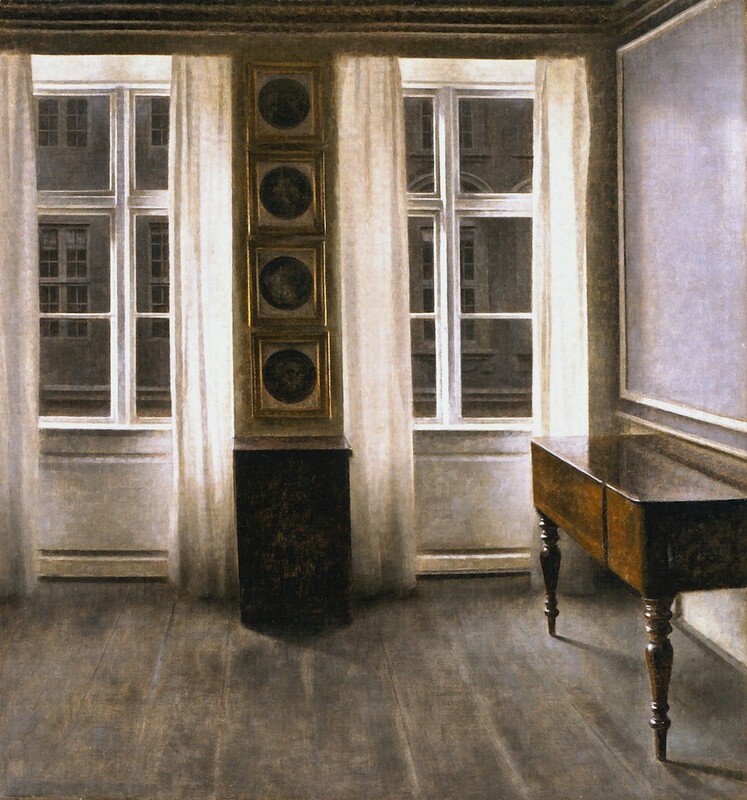 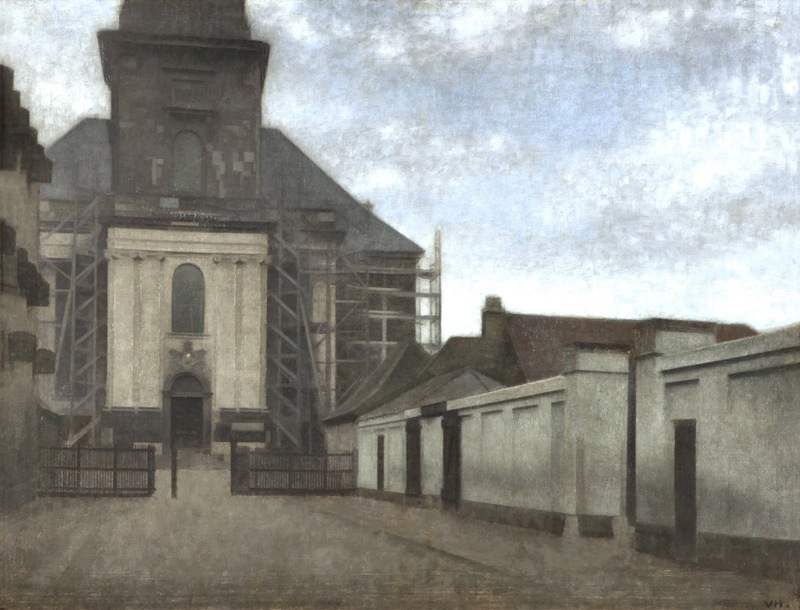 Hammershøi’s melancholic vision has now regained its place in the public consciousness. 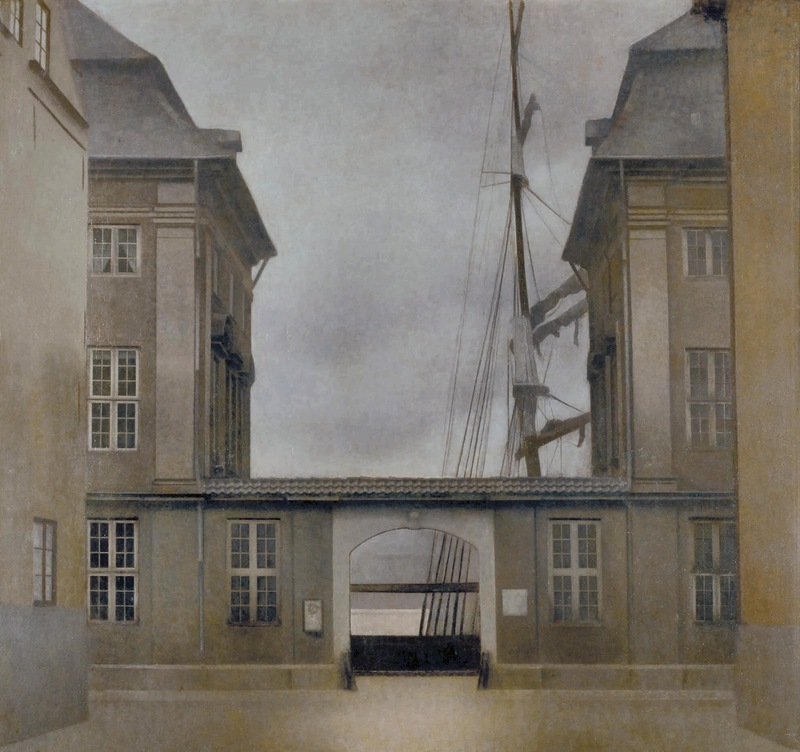 He is now one of the best-known artists in Scandinavia, and comprehensive retrospectives of his work have been organized by the Musée d'Orsay in Paris and the Guggenheim Museum in New York. 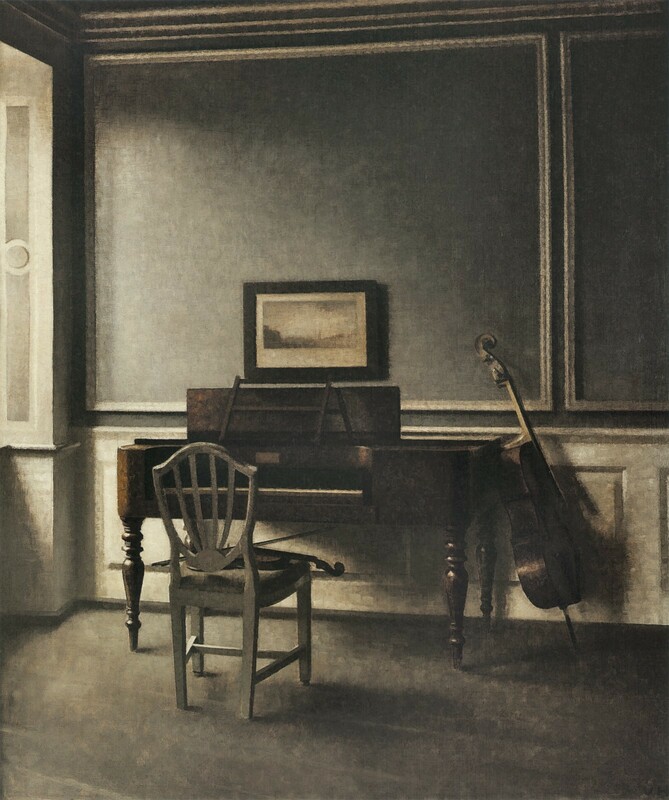 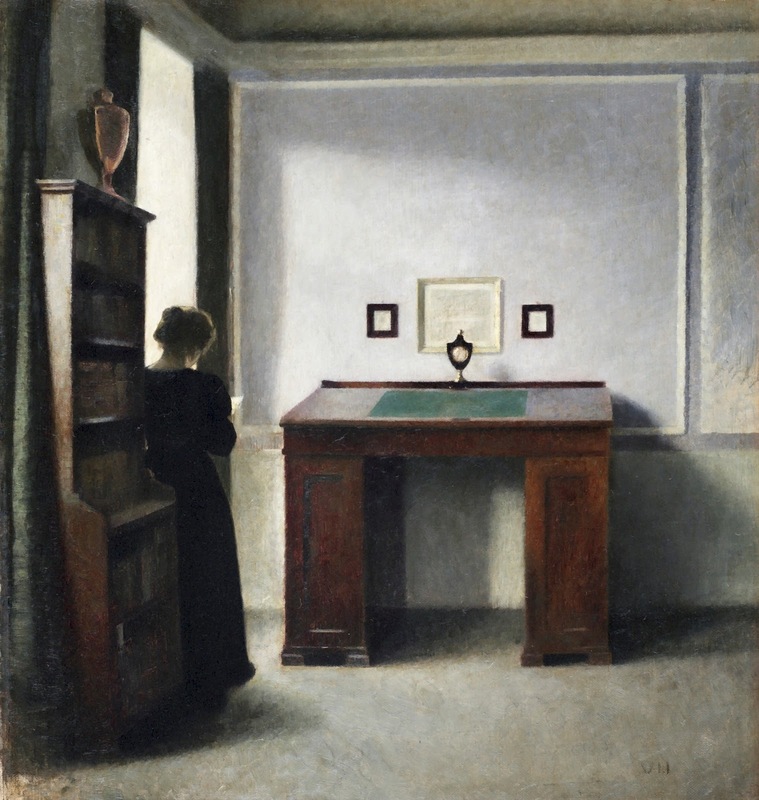 In 2008, the Royal Academy of London hosted the first major exhibition in Britain of Hammershøi’s work, Vilhelm Hammershøi: The Poetry of Silence. 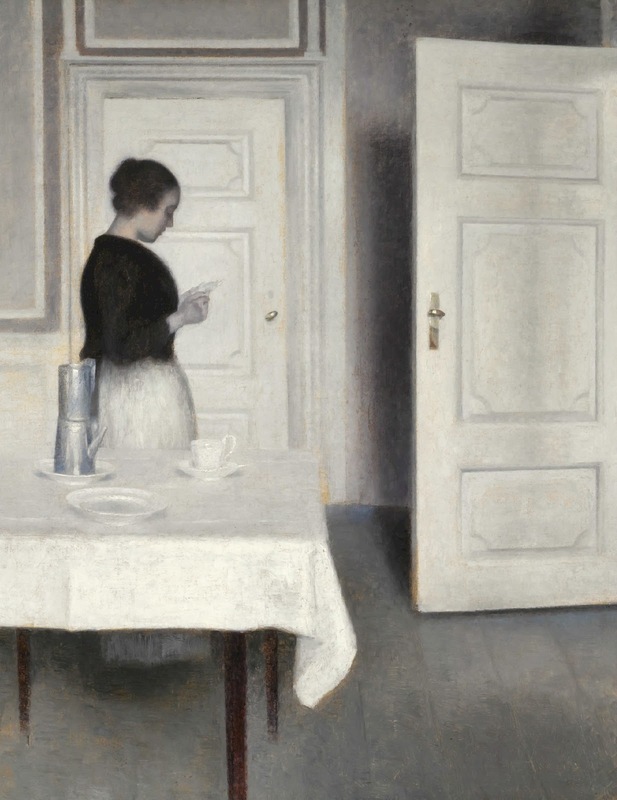 Hammershøi’s only painting on constant display in Britain is 'Interior' in the National Gallery. 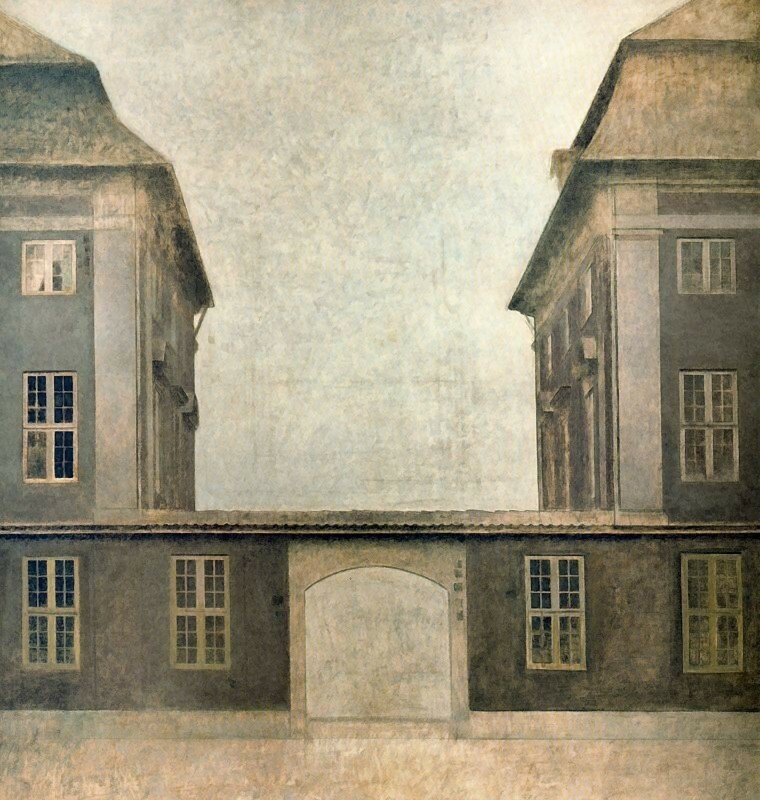 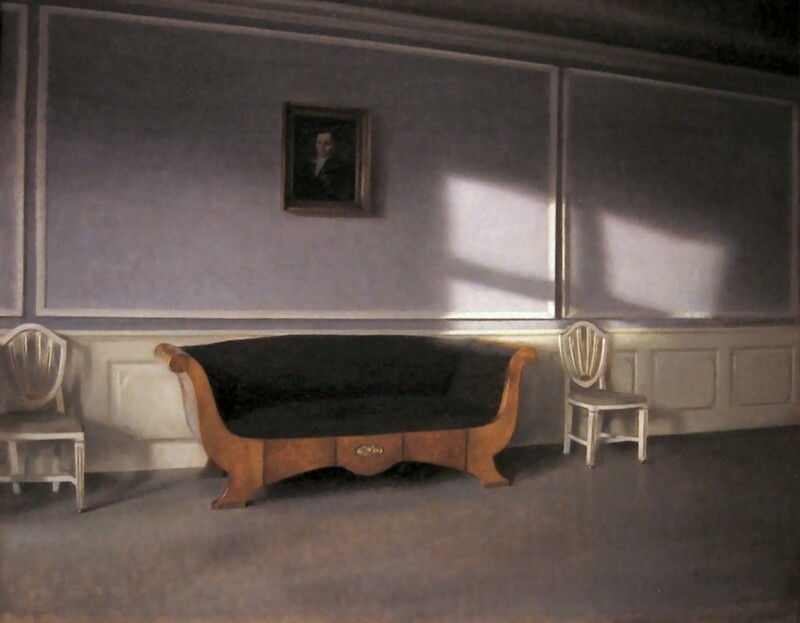 In 2005, Hammershøi's life and oeuvre was featured in a BBC television documentary, Michael Palin and the Mystery of Hammershoi, with the British comedian and writer Michael Palin. 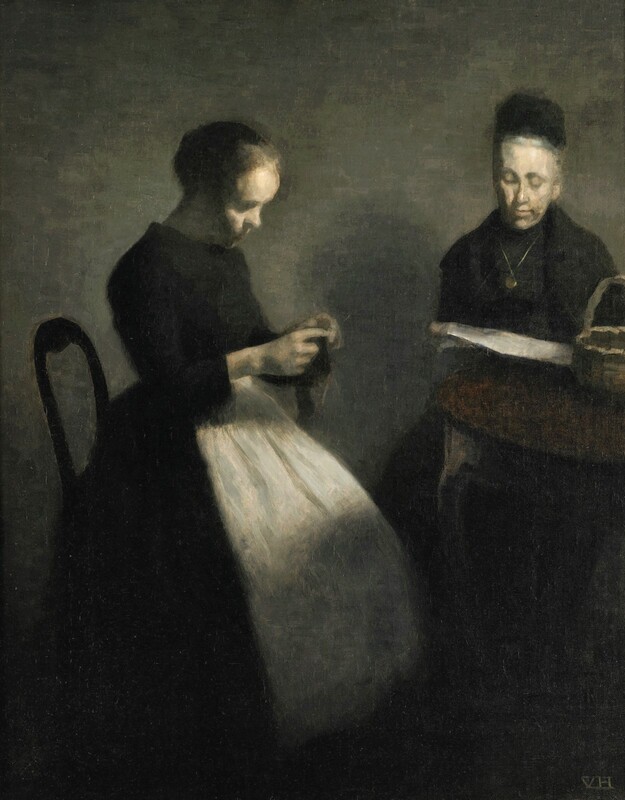 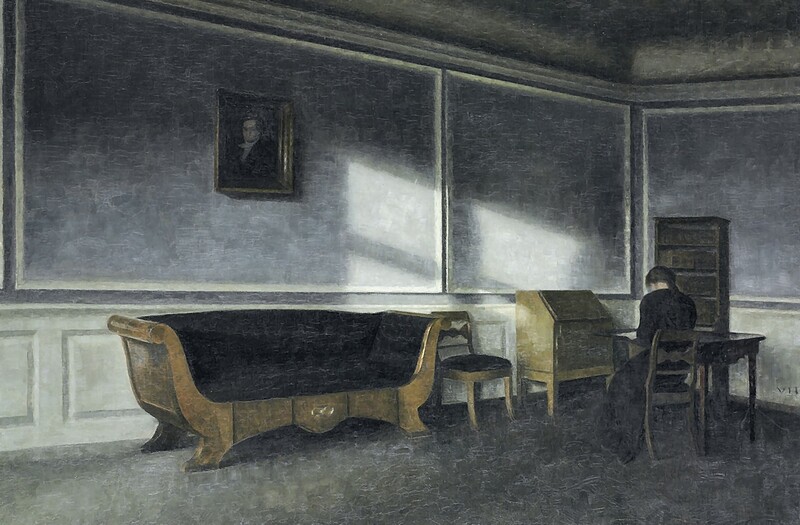 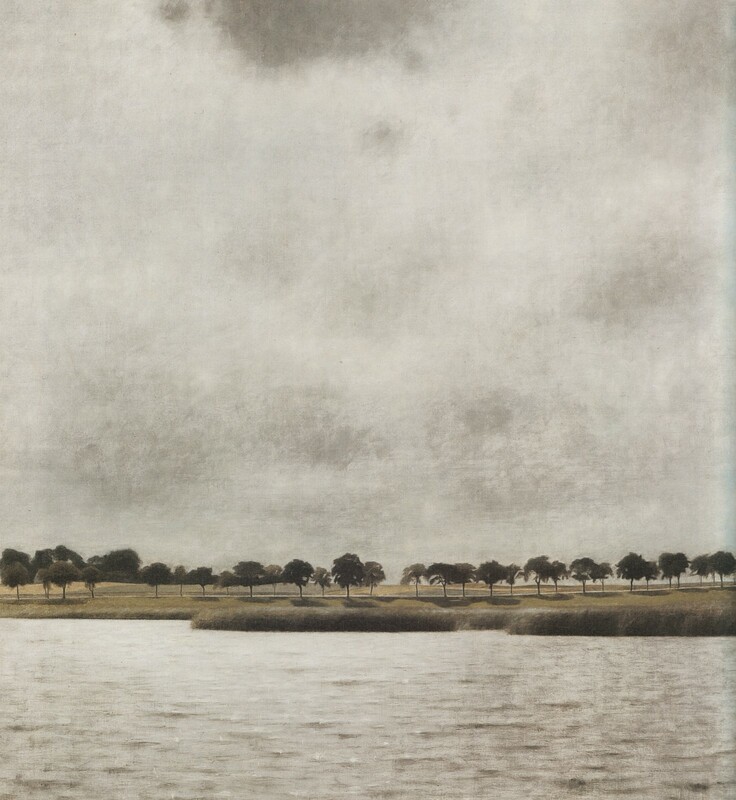 In the programme, Palin, fascinated by Hammershøi, whose pictures he conceived as having a distinct enigmatic coolness and distance about them, sets out to unlock the mysteries and find out about the background of Hammershøi. 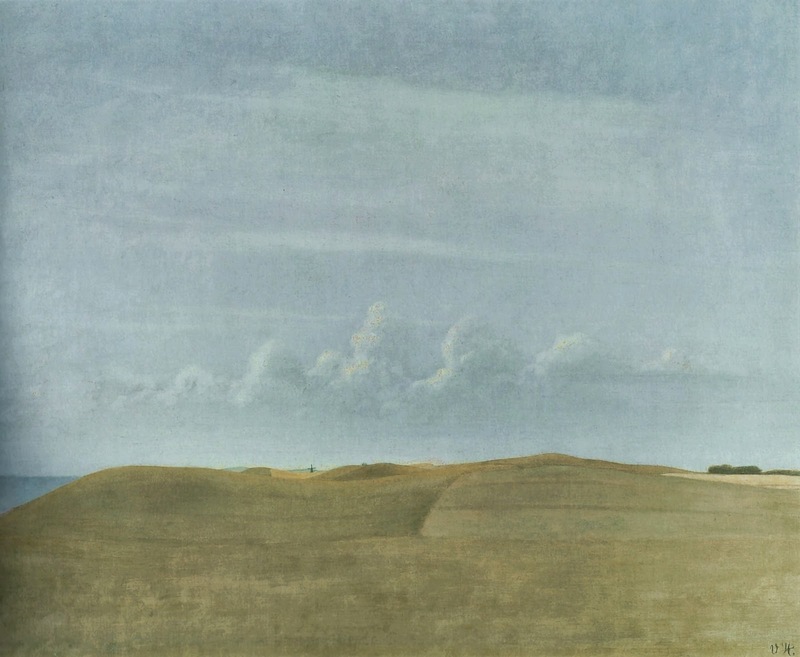 Palin, wanting to know of his inspirations and the reason for these mystical pictures, started his search in Hayward Gallery in London, goes to Amsterdam and finally to Copenhagen. 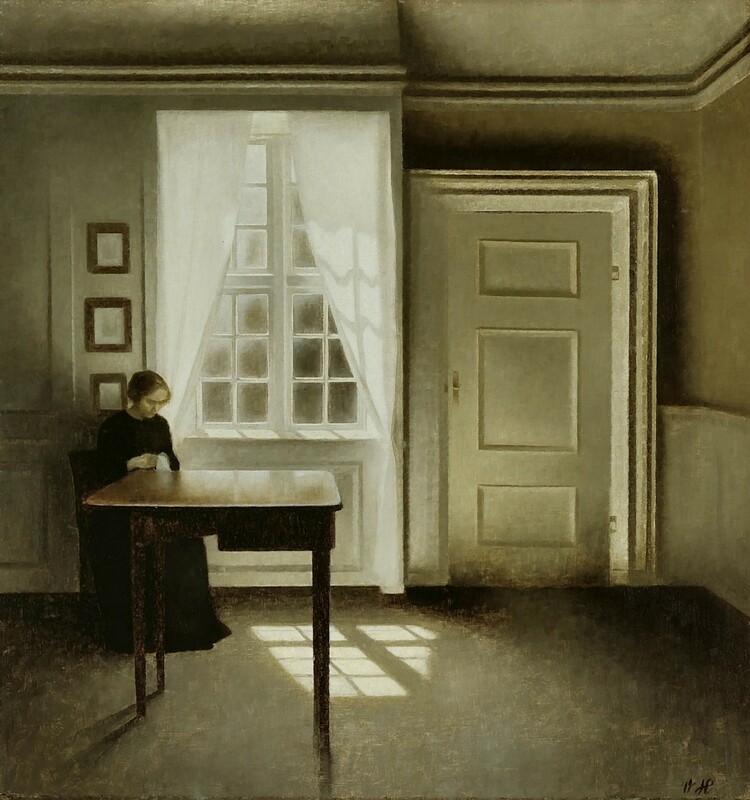 In June 2012, Hammershøi's Ida læser et brev (Ida Reading a Letter) was auctioned by Sotheby's in London for £1,721,250 or DKK 15,747,499, a record for any Danish work of art. 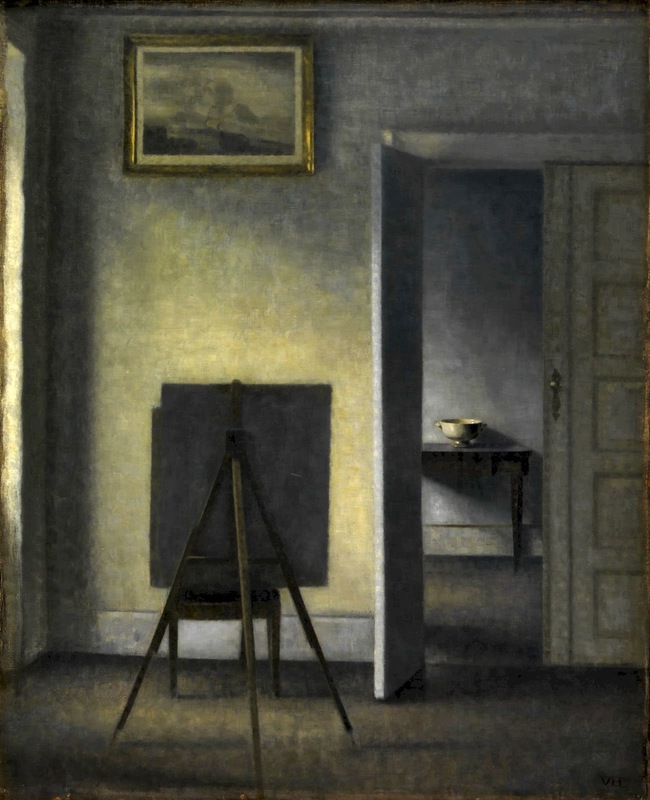 Two other paintings by Hammershøi were also sold the same day at Sotheby's for unusually high prices: Interiør med to lys (Interior with Two Candles) was auctioned for DKK 10,110,000 and Ida i interiør (Ida in Interior) for DKK 6,120,000. 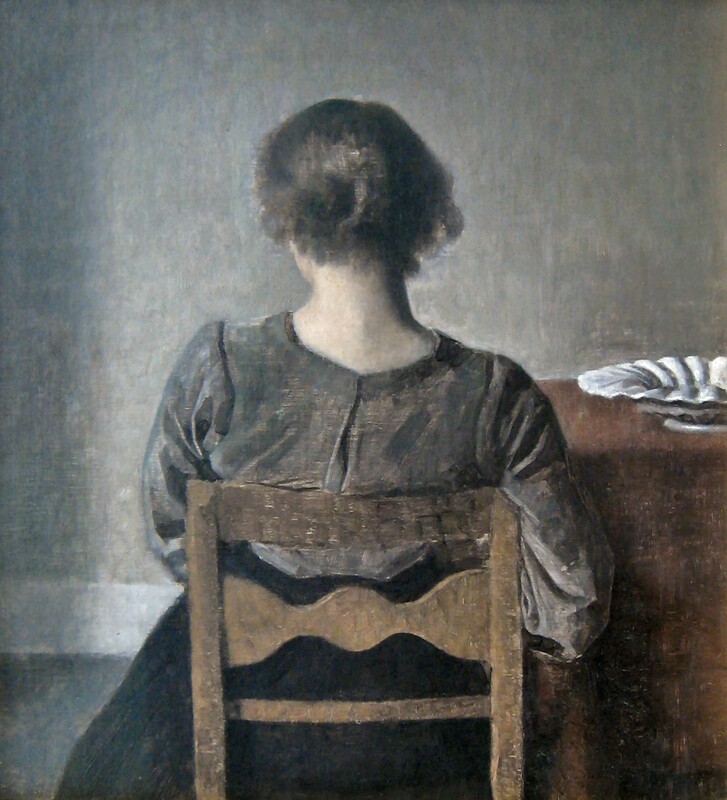 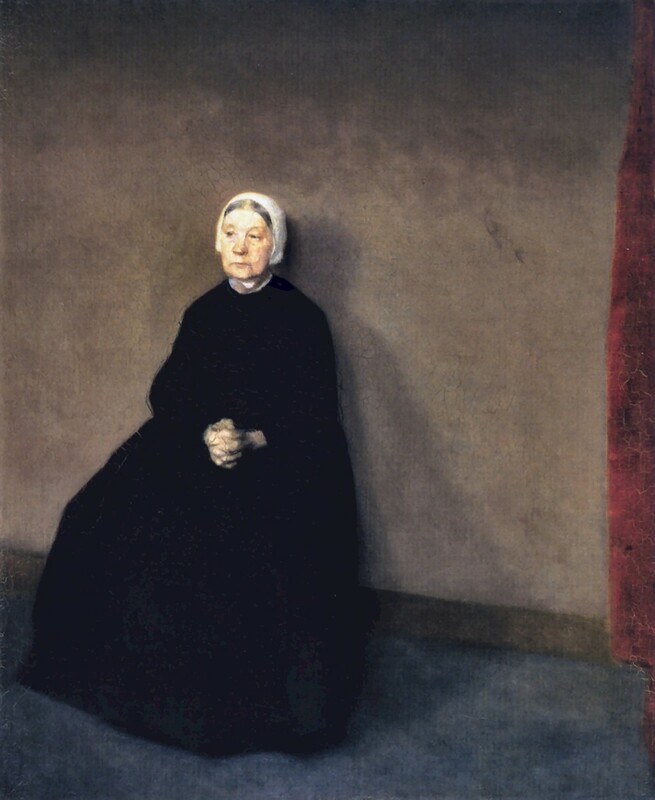 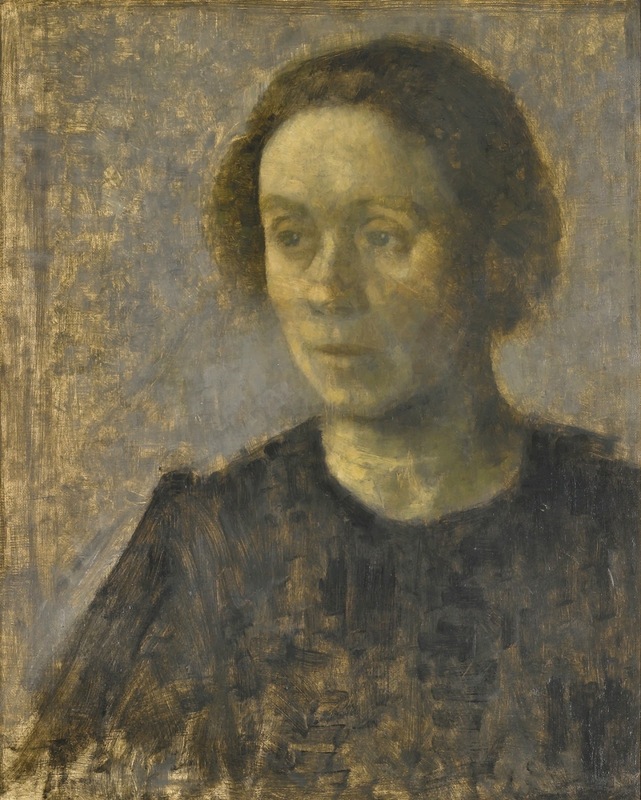 Vilhelm Hammershøi (Copenaghen, 15 maggio 1864 - 13 febbraio 1916) è stato un pittore Danese. 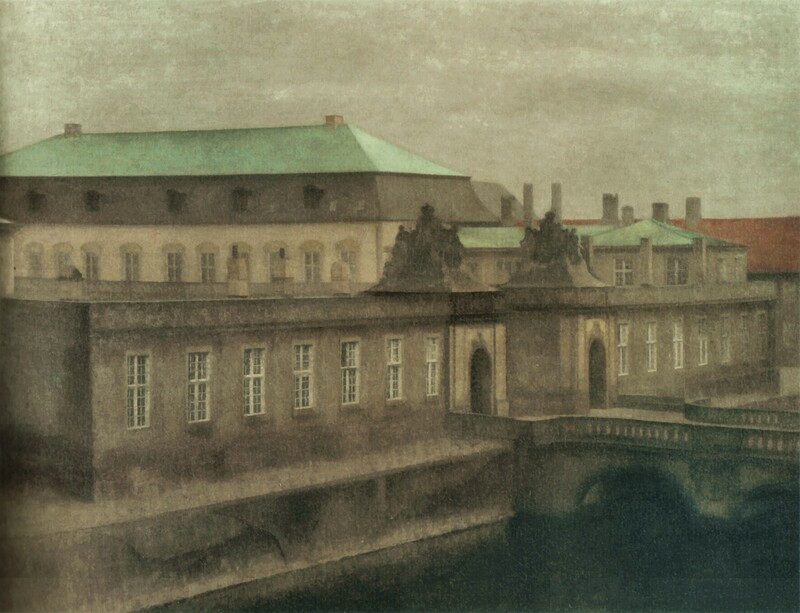 Figlio di un mercante, studiò pittura dall'età di otto anni, frequentando anche l'Accademia delle Belle Arti di Copenaghen. 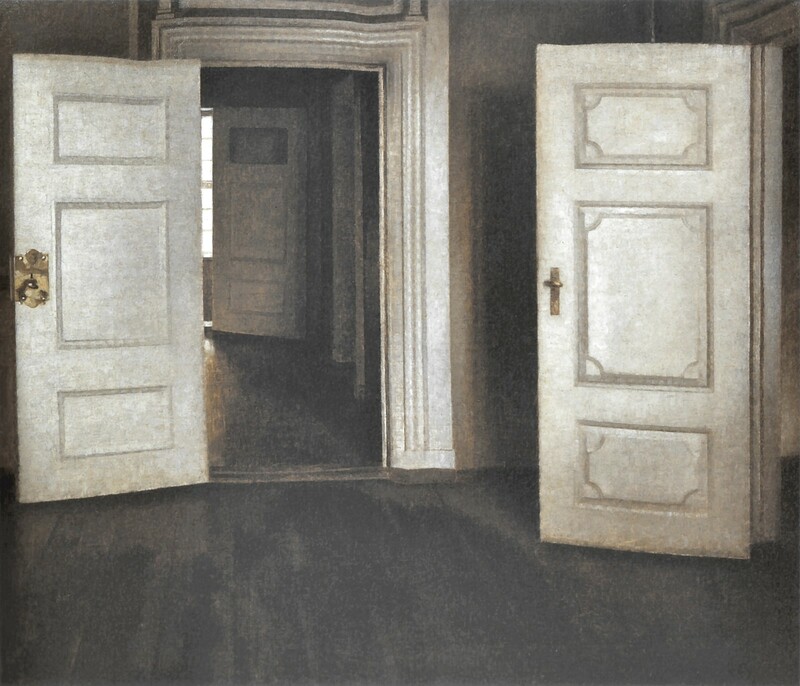 Lavorò soprattutto nella sua città di origine, eseguendo ritratti, dipinti di architetture e interni. 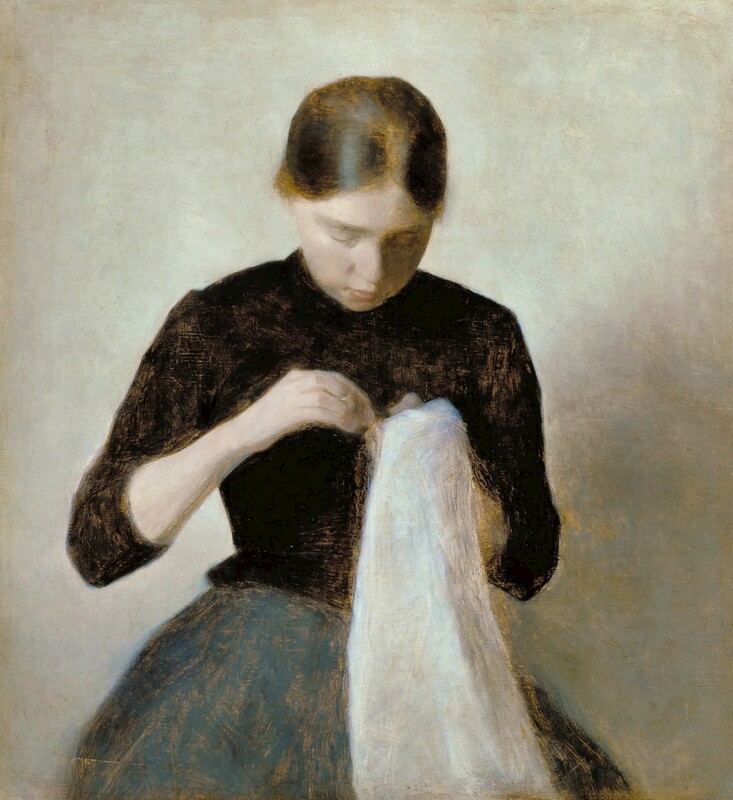 Si riporta che Auguste Renoir** avesse ammirato i dipinti di Hammershøi. 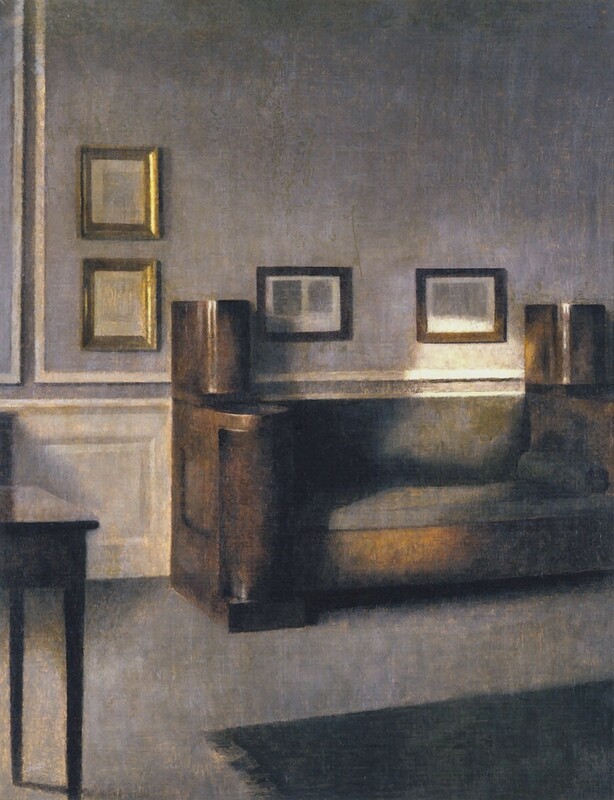 I suoi dipinti, di un realismo rarefatto e silenzioso, sono conservati in musei internazionali. 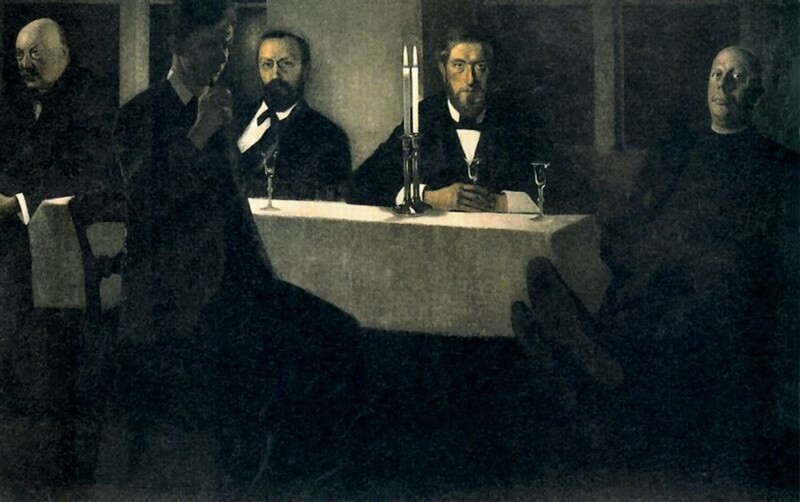 Sue retrospettive sono state organizzate al Museo d'Orsay a Parigi e al Museo Guggenheim di New York.